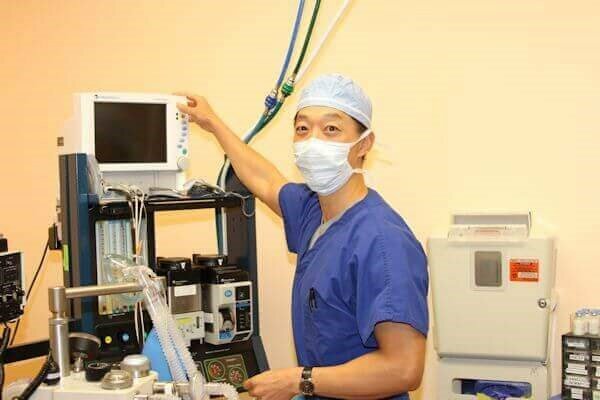 Board-Certified Anesthesiologist attending to a plastic surgery patient in an accredited operating room. An increasing number patients ask to have their surgery done with local anesthesia "because it's safer." This correlates with the increasing number of doctors who aren't plastic surgeons but who perform cosmetic surgery learned at weekend courses taught by other non-plastic surgeons. The main selling point for their practice is that they do plastic surgery "under local anesthesia." Love the Local Anesthesia--Too Bad It Was the Wrong Procedure! The problem with choosing a specific procedure solely because it can be done under local anesthesia is that your surgeon may not be offering you the correct procedure. Why not? Because he may not know how to do it. If a doctor can only do liposuction under local anesthesia, but you need a tummy tuck, he may tell you liposuction is your only safe option. We see many such patients who are unhappy after a non-plastic surgeon left them with loose, lumpy skin. They lost time and money, and they still need a tummy tuck to address their concerns. Similarly, many doctors perform mini tummy tucks under local anesthesia "because it's safer," even on patients who need full tummy tucks under general anesthesia. Those patients consult with us, wondering why their belly button is pulled down and their tummy still bulges. They got the local anesthesia they wanted, but they got the wrong operation. Patients wanting a breast lift sometimes come to us after a non-plastic surgeon gave them breast implants. The patient had the "safe operation under local anesthesia" because the other doctor didn't know how to perform a breast lift. They come to us to find out if their breasts can be fixed. Is the doctor a board-certified plastic surgeon who operates in an accredited operating room? Do you really think that board-certified plastic surgeons value their patients' safety less than non-plastic surgeons do? Does the doctor truly have your safety at heart? Can he do only a limited number of procedures and is steering you towards the procedure that's best for him, but not best for you? Does he offer only local anesthesia because an anesthesiologist won't come to an office without an accredited operating room with the highest safety standards? Are you truly safer undergoing a procedure without an anesthesiologist or a recovery room nurse? Local anesthesia is cheaper and is generally safe, but it's not infallible. Reports indicate that Joan Rivers had local anesthesia and sedation during her last procedure, and we all know the outcome. She did not have general anesthesia. Even without sedation, fatalities can result from toxic levels of local anesthesia, limiting how much can be safely done. All board-certified plastic surgeons are trained to do procedures under general anesthesia as well as local anesthesia with and without sedation. Non-plastic surgeons don't have a monopoly on that knowledge. As board-certified plastic surgeons, we won't offer you the incorrect procedure under the guise of "safety" because we don't know how to do the correct procedure and have no access to general anesthesia. Protect yourself, and ask questions.